A few weeks ago I saw that Memebox posted a picture on their Instagram of their Juice Box which contains 30 sheet masks! I am currently using sheet masks everyday so I bought this box to expand my sheet mask collection. 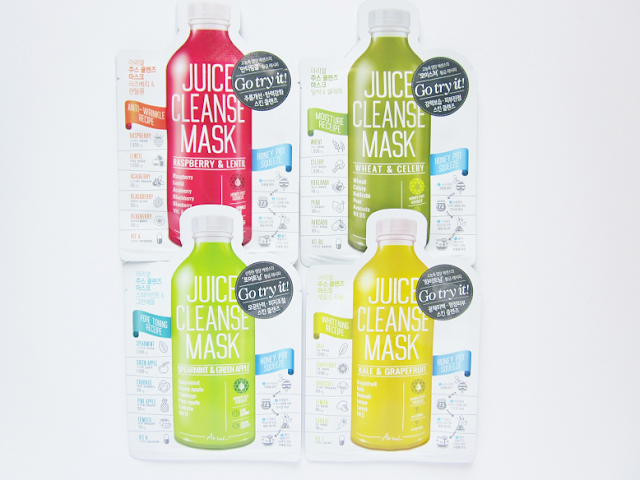 The Juice Box contains 30 sheet masks. There is a variety of sheet masks to choose in this kit so I'm excited to try out different sheet masks from different brands I've never tried before. 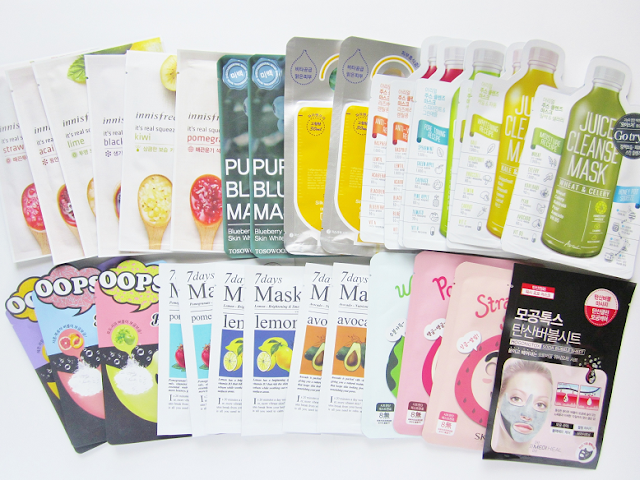 Let's take a look at all the sheet masks included in this box. I've never tried any of the Innisfree masks before but have always wanted to try them! 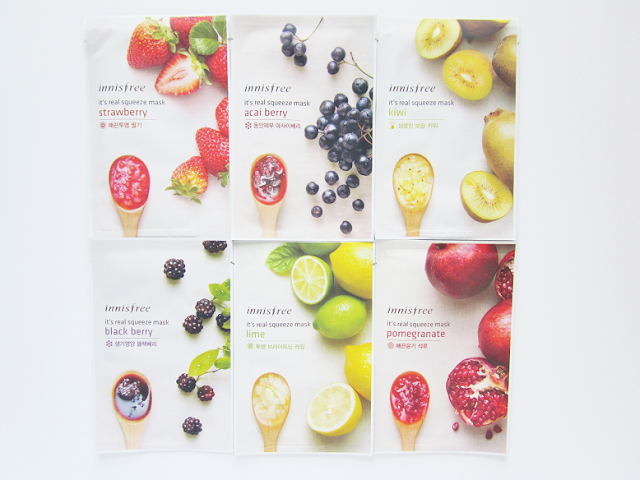 I'm glad that they included six different masks, there is strawberry, acai berry, kiwi, black berry, lime and pomegranate. You guys have probably seen those creepy looking animal sheet masks floating around before, but have you ever seen a fruit version? 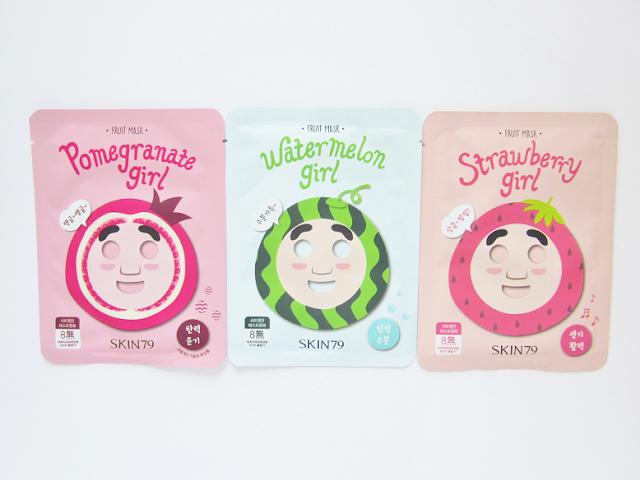 Well Skin79 has made pomegranate, watermelon and strawberry sheet masks! Unlike those animal masks these actually look cute and might not make you look like a serial killer. I got 2 of these sheet masks. The packaging reminds me of those advertisements you get on your door or hotel. 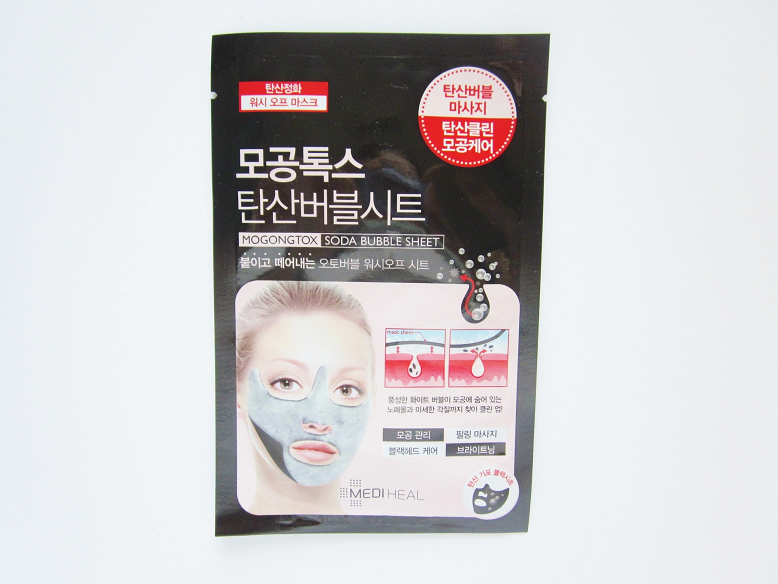 Apparently this mask is super poplar in Korea and one is sold each second (who keeps track of that really?). I have super high expectations on this mask now and might even review it for you guys. 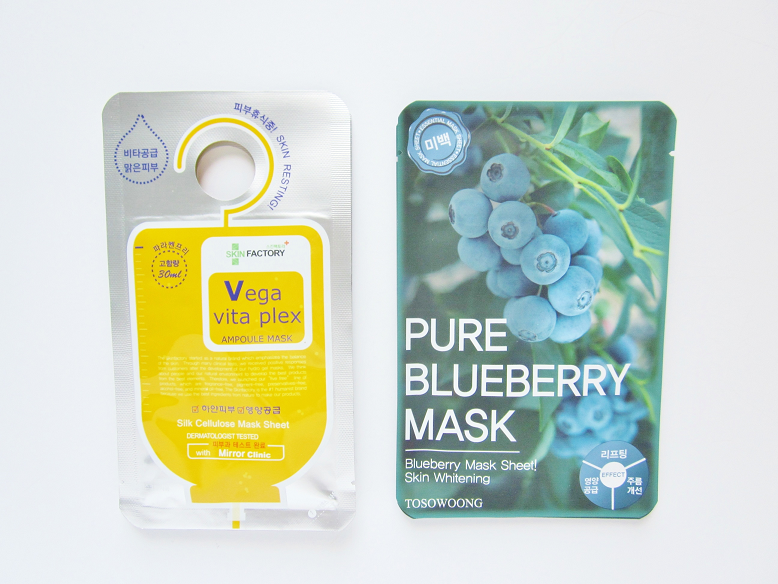 I also got two copies of the Tosowoong Pure Blueberry mask. I've seen this mask around but never had any interest in using it. It's a whitening sheet mask, which I enjoy so hopefully it will brighten my face beautifully! I received these 7 Day Masks previous in a Ariul Memebox I ordered a while ago. I got two of each mask. 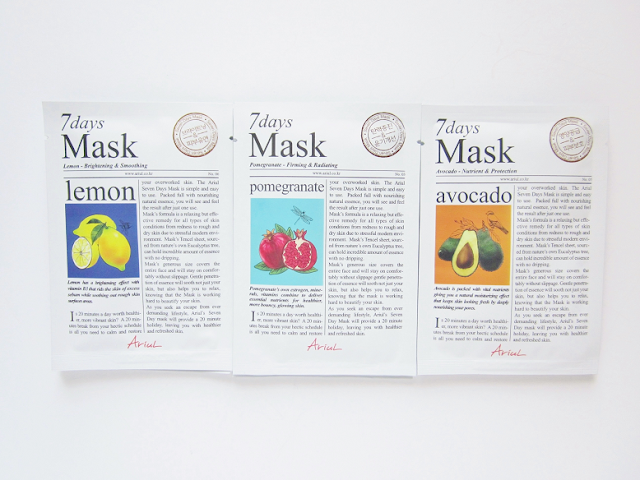 I've tried the lemon and avocado masks before but the pomegranate is new to me. These masks were also in the Ariul Memebox. Again I got two of each of these mask, 8 total. Ariul has some really cute packaging when it comes to sheet masks but after trying all these masks before I wouldn't personally buy them. If you would like me to go into more detail as to why I didn't enjoy both the 7 Day and Juice Cleanse Masks let me know and I will write a review on them. Out of all the masks I'm most excited to try these bubble masks! 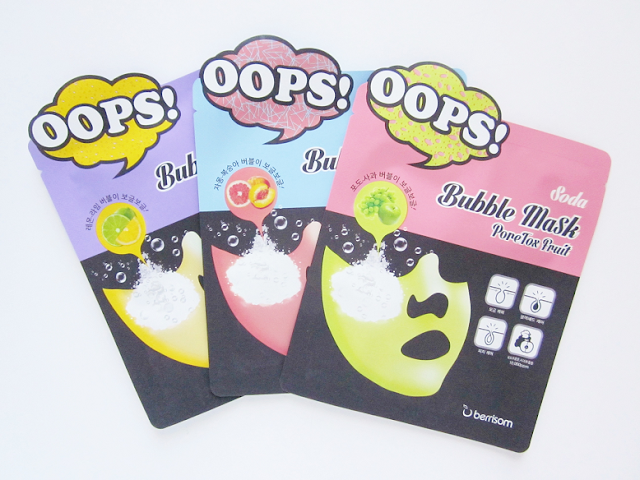 These are self-bubbling masks that contain carbonated sparkling water to give you brighter and clearer skin. My only complaint is that the mask don't cover your forehead! I mean don't you want to experience this on your forehead as well? So this mask doesn't come with the Juice Box, I ordered this separately. After watching Morgan from The Beauty Breakdown review this I was sold! It's also a bubble mask like the Berrisom ones but this is from a different brand so the results may differ.